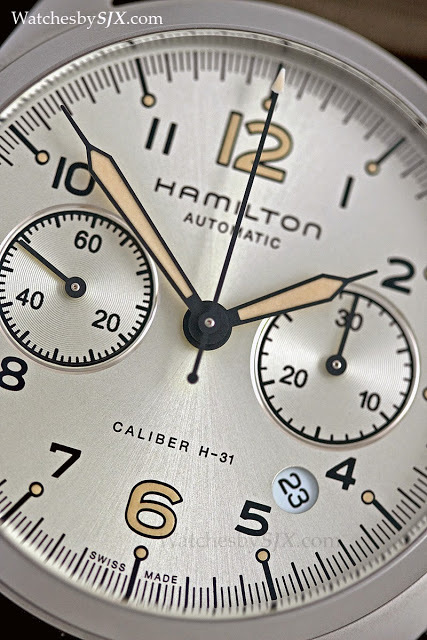 At Baselworld earlier this year Hamilton unveiled its latest vintage remake, the Khaki Pilot Pioneer Auto Chrono, inspired by the chronographs it supplied the RAF in the seventies. 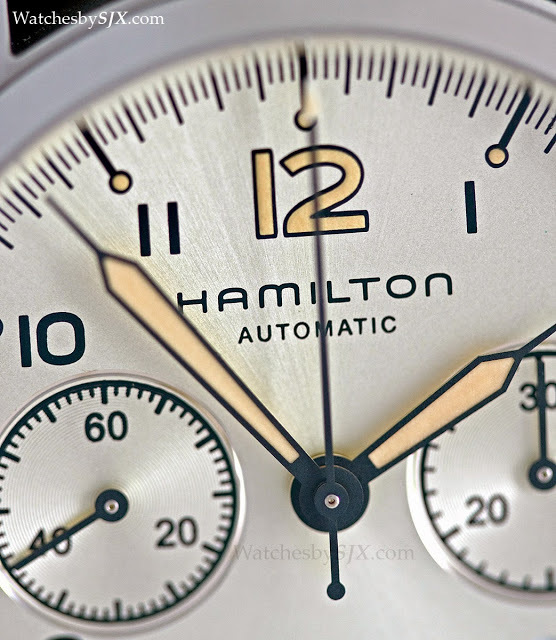 Hamilton has enjoyed an good run with its vintage inspired timepieces, including last year’s Khaki Navy Pioneer which could be converted into a desk clock. 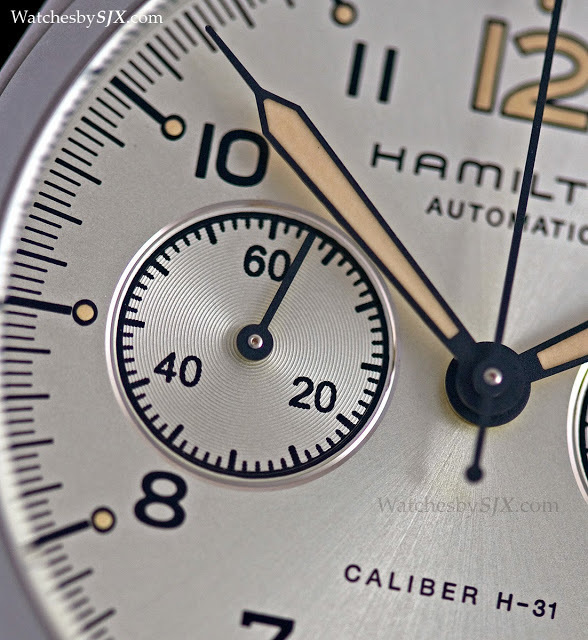 This year Hamilton has taken inspiration from the 6BB chronographs it (along with other companies like CWC) supplied to Britain’s Royal Air Force (RAF) in the seventies, with their distinctive, asymmetrical cases. 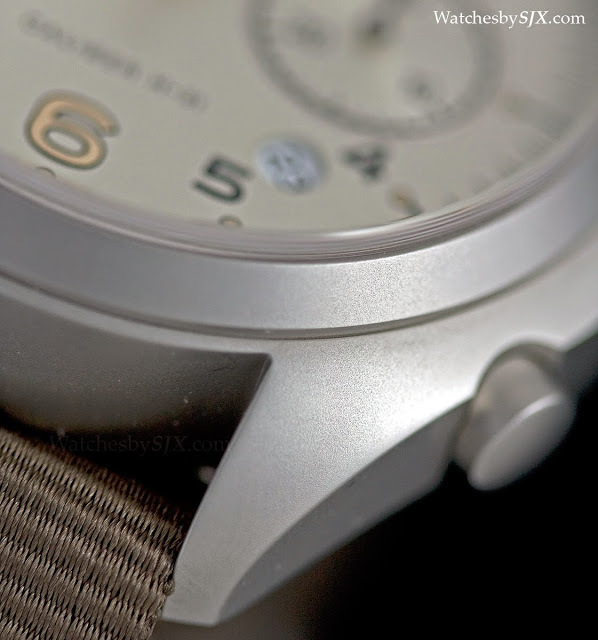 While not identical to the original, the new Khaki Pilot Pioneer Auto Chrono is a well executed remake. 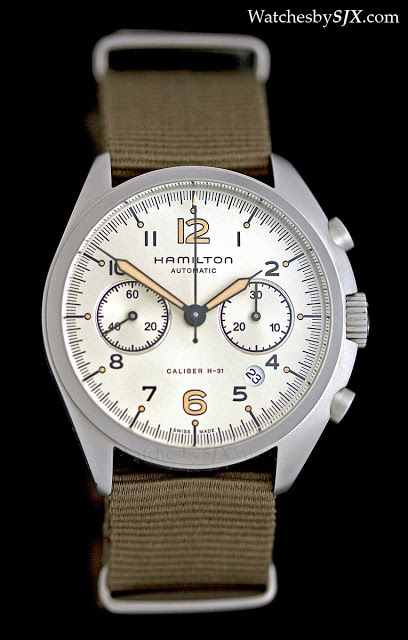 Unlike the earlier reissue watches, however, the Khaki Pilot Pioneer Auto Chrono is part of the regular collection. 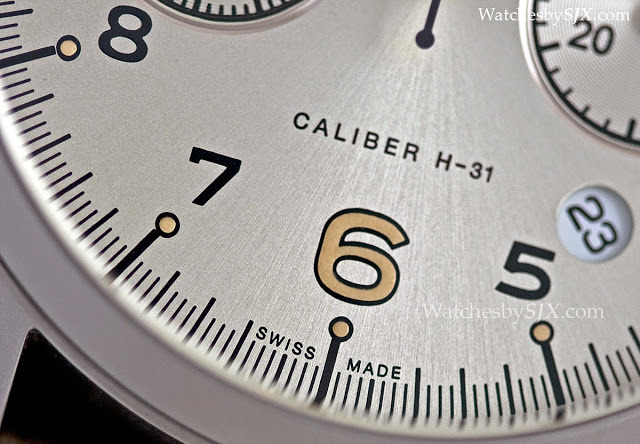 It is available in two dial colours, black as the original 6BB was, and also a silverish, champagne tone which is pictured here. The black dial has a matte finish with bright white Luminova, while the silver dial has a sunburst brushed, metallic finish. 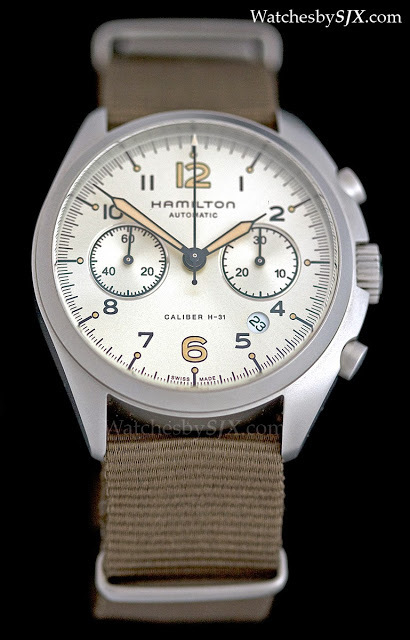 Obviously the black dial is the more conventional military watch guise, though there were less common RAF chronographs with white dials. 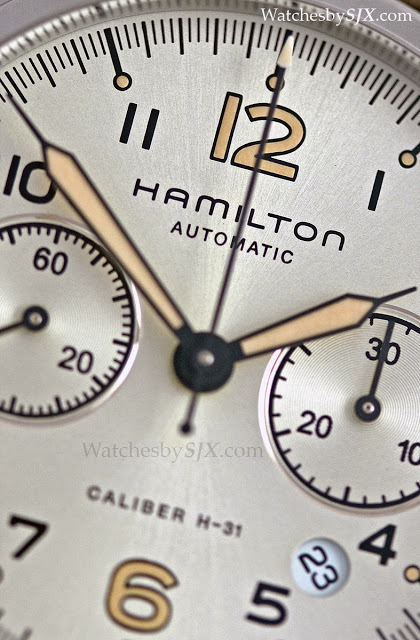 In any case the silver dial is attractive, especially combined with the faux aged Luminova. Another concession to modernity is the thankfully small, round date window. Though I would rather not have it, the date is practical and is not as obtrusive as expected. 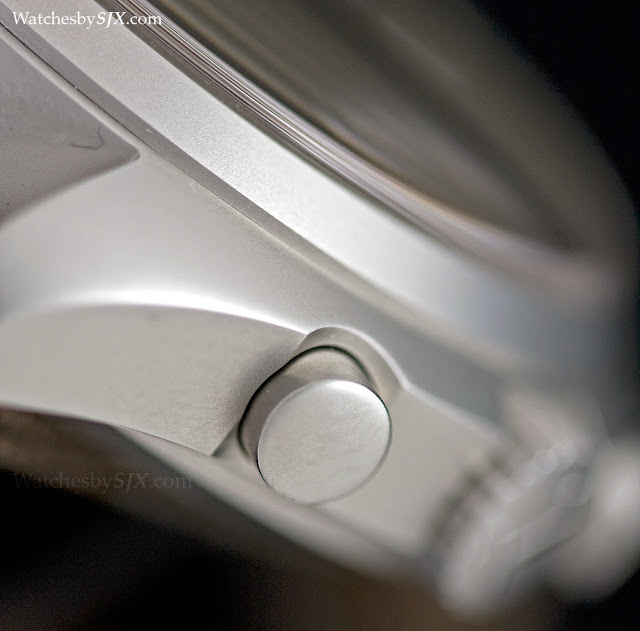 Aside from the dial, both versions are identical with sandblasted, 41 mm steel cases. 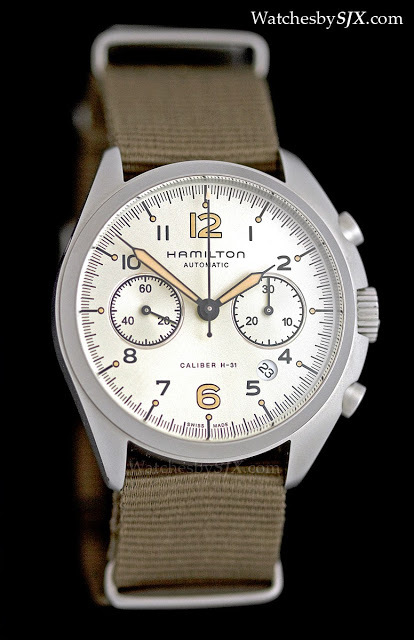 Just like the originals, the Khaki Pilot Pioneer Auto Chrono has an asymmetric case, with a wider case band on the right to protect the crown and pushers. 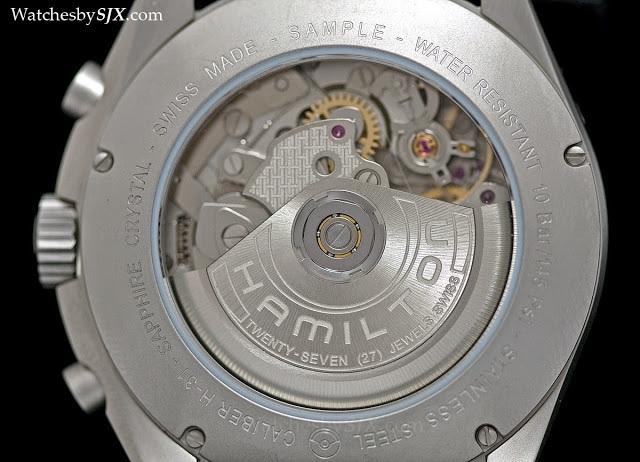 The slightly domed sapphire crystal is a welcome extra. Thought larger than the original, the Khaki Pilot Pioneer Auto Chrono is an easily wearable size, with some thickness that gives it a solid wrist feel. 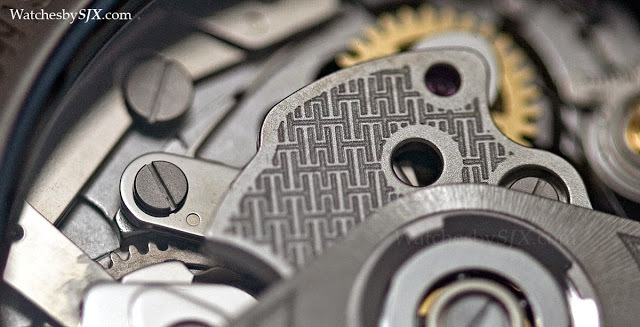 Revealed through the display back is the H-31 movement, which is actually a version of the Valjoux 7750 with an extended 60 hour power reserve exclusive to Hamilton. It has rudimentary decoration on the bridge and rotor, but is otherwise as industrial and rough as would be expected in this price range.